The meters are available with different scales and length. Extra long for makes the graduation clearer and makes it easier to read accurately. 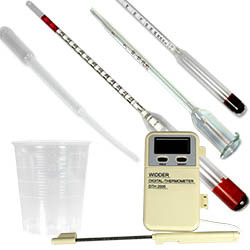 An alcohol meter is used with a graduated cylinder. The cylinder is filled with alcohol and the meter is submerged and is floating in alcohol. When the alcohol meter has found its equilibrium in the alcohol the strength can be read on the scale. Make sure to buy a graduated cylinder that is big enough for the meter.